The scientific enterprise, like anything else humans are doing, is subject to fashions, trends and hypes. Old ideas get replaced by new ones; good new ideas spread; progress is made. However, is Neuroscience forgetting where it came from? This is not that hard to investigate in a quantitative way because every source that is cited by an article is referenced. 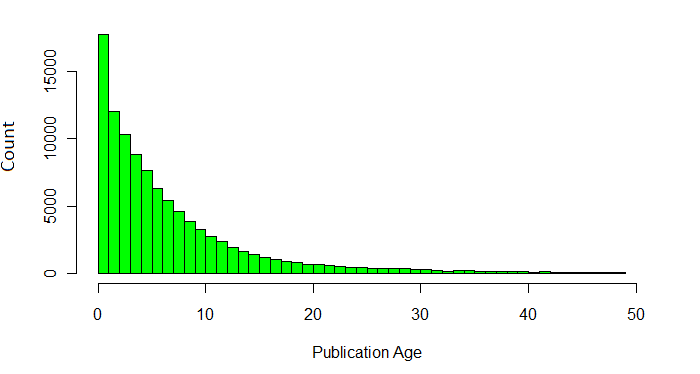 Below, I plot the ages of all references found in reviews and review-like articles (opinions, perspectives…) published in a well known Neuroscience journal (Nature Reviews Neuroscience). As you can see, the relative majority of articles which a review cites are very very recent, i.e. less than two years old. Twenty year old sources hardly every get mentioned. One could argue that the pattern seen above – the very fast rate of decline which levels off near zero – is simply a reflection of the publication rate in Neuroscience. If more is published, more can get referenced. However, compare the above plot with the one below, which shows the publication rate in the Neurosciences from 2011 all the way back to 1975. An increase in publication rate is there but it is not nearly as quick as the aforementioned graph would have you believe. Notice the white bars in Figure 2. These show the overall number of reviews in Neuroscience. 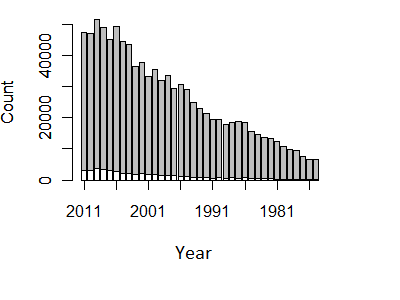 While in 1975 only 46 Neuroscience reviews got published, in 2011 it was nearly 3000. Given that it is impossible to read anything like 40000 original articles each year, it makes sense to only read the summaries. Perhaps, once summarised, an original article’s gist survives in the form of a brief mention in a review while its details are simply forgotten. Another possibility is the decline effect I blogged about before. Old articles which proved unreliable should be forgotten in order to edge closer to some scientific truth. They may have suffered from publication bias, sub-optimal techniques and/or sampling bias. So, Neuroscience is indeed forgetting. However, whether this is all that bad is another question. 1) Data processed with own code. Original data from NRN website. 2) Data from Web of Science.